Researchers have used light patterns to control the swimming speed of bacteria and direct them to form different shapes, according to a new study (“Dynamic density shaping of photokinetic E. coli”) in eLife. Controlling bacteria in this way means it could be possible to use them as microbricks for building the next generation of microscopic devices. For example, they could be made to surround a larger object such as a machine part or a drug carrier, and then used as living propellers to transport it where it is needed. “Many motile microorganisms react to environmental light cues with a variety of motility responses guiding cells towards better conditions for survival and growth. The use of spatial light modulators could help to elucidate the mechanisms of photo-movements while, at the same time, providing an efficient strategy to achieve spatial and temporal control of cell concentration. Here we demonstrate that millions of bacteria, genetically modified to swim smoothly with a light controllable speed, can be arranged into complex and reconfigurable density patterns using a digital light projector,” write the investigators. Escherichia coli (E. coli) bacteria can swim a distance of ten times their length in a second. They have propellers that are powered by a motor, and they usually recharge this motor by a process that needs oxygen. Recently, scientists found a protein (proteorhodopsin) in ocean-dwelling bacteria that allows them to power their propellers using light. By engineering other types of bacteria to have this protein, it is possible to place a “solar panel” on every bacterial cell and control its swimming speed remotely with light. To do this, Dr. Frangipane and his team sent light from a projector through a microscope lens, shaping the light with high resolution, and explored how E. coli bacteria alter their speed while swimming through regions with varying degrees of illumination. 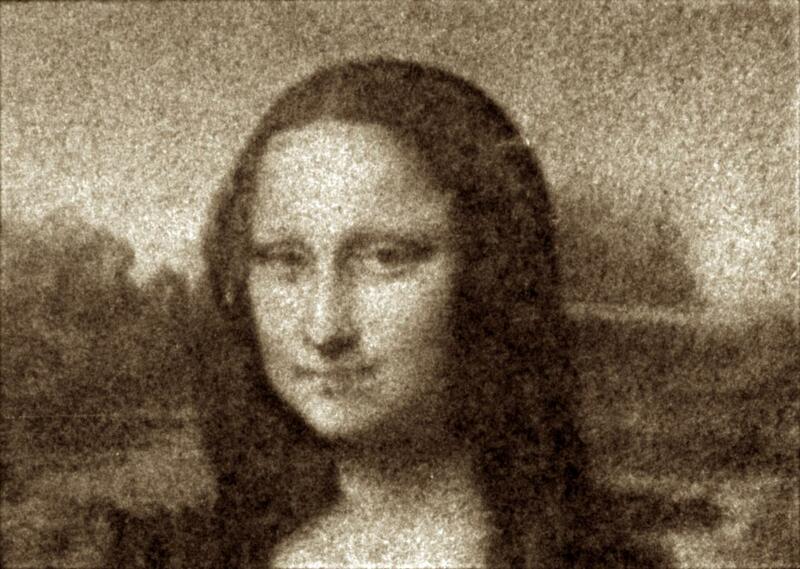 They projected the light uniformly onto a layer of bacterial cells for five minutes, before exposing them to a more complex light pattern—a negative image of the Mona Lisa. They found that bacteria started to concentrate in the dark regions of the image while moving out from the more illuminated areas. After four minutes, a recognizable bacterial replica of Leonardo da Vinci's painting could be seen, with brighter areas corresponding to regions of accumulated bacterial cells. Although the shape formed by the bacteria was recognizable, the team found that the engineered E. coli were slow to respond to variations in light, which led to a blurred formation of the target shape. To remedy this, they used a feedback control loop where the bacterial shape is compared to the target image every 20 seconds, and the light pattern is updated accordingly. This generated an optimal light pattern that shaped cell concentration with much higher accuracy. The result is a photokinetic bacterial cell layer that can be turned into an almost perfect replica of a complex black-and-white target image.